My cousin and his wife just had their first baby on Friday. Welcome little Tobin Lee to the world! 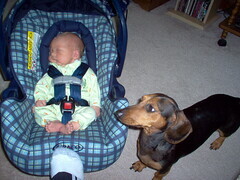 The four-legged friend in the photo is "big sister" Hannah. Grandmother is now a great-grandmother. How odd that seems. Everyone's growing up and growing old. Ah, one cannot stem the tide of time. But we can sure enjoy the good stuff along the way, no? More cutie-patootie photos of Tobin (and a set of Hannah too!) and of his family are available at Flickr (click To's pic). There's even a "Toblog."